Ok, we know, you have heard this one before...but let's start up the band anyway! 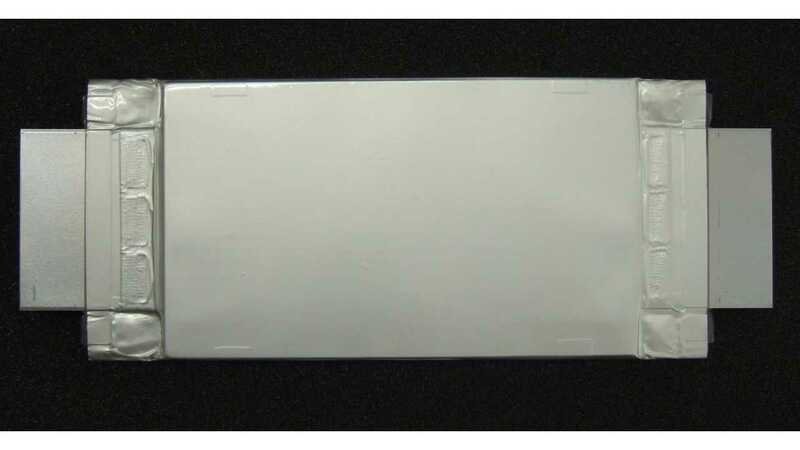 Toshiba has announced its next-generation SCiB lithium-ion batteries with a new anode material - titanium niobium oxide, that apparently doubles the capacity of the anode of current SCiB. The prototype 50 Ah cells can be recharged in about 6-minutes. 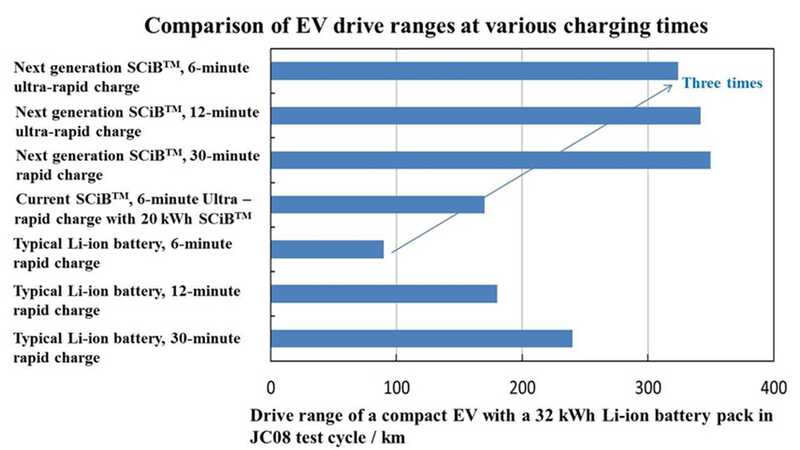 According to the graph above, a 6-minute charging would enable one to drive three-times further (320 km / 199 miles in JC08) than using a typical lithium-ion batteries (using a 32 kWh battery). 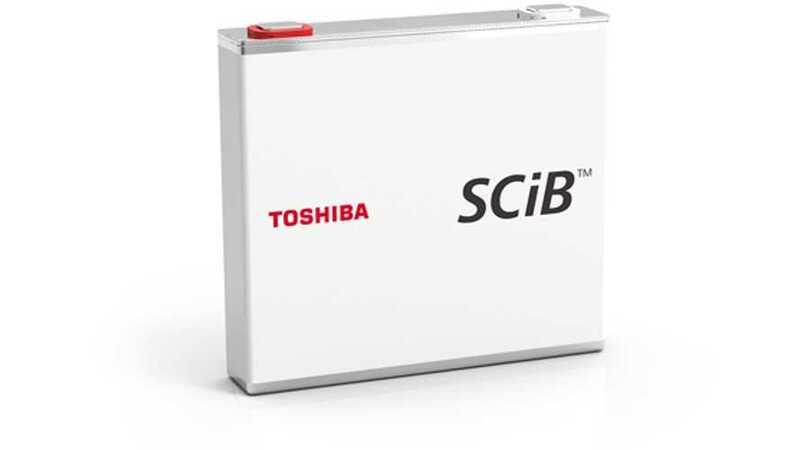 Toshiba said that the new SCiB also retains a long life cycle, low-temperature operation, excellent safety and rapid recharging characteristics of the current SCiB. Over 90% of capacity is said to be maintained after 5,000 charge/discharge cycles ,and ultra-rapid recharging can also be done in cold conditions, with temperatures as low as minus 10°C, in only ten minutes. So outside of the density today, its perfect...the only other thing not discussed unfortunately, is the cost per kWh (the main criteria behind the mass adoption of any new battery tech over another), of which could prove to be the most serious stumbling block - so there might be a couple hiccups. Developments are ongoing, as commercialization is planned for fiscal year 2019. "Toshiba Corporation, an industry leader in lithium-ion battery technology, today announced the development of its next-generation SCiBTM, which uses a new material to double the capacity of the battery anode. The new battery offers high- energy density and the ultra-rapid recharging required for automotive applications, and will give a compact electric vehicle (EV) with a drive range of 320km* after only six minutes of ultra-rapid recharging—three times the distance possible with current lithium-ion batteries. Building on this heritage, Toshiba has developed a proprietary method for synthesizing and disarranging crystals of titanium niobium oxide and storing lithium ions more efficiently in the crystal structure. The anode of the next-generation SCiBTM realized through this approach has double times the capacity of the anode of current lithium-ion batteries." "Rigorous testing of a 50Ah prototype of the new battery has confirmed that it retains the long life cycle, low-temperature operation, excellent safety and rapid recharging characteristics of the current SCiBTM. The energy density by volume of battery is twice that of the current SCiBTM. The next-generation SCiBTM maintains over 90% of its initial capacity after being put through 5,000 charge/discharge cycles, and ultra-rapid recharging can be done in cold conditions, with temperatures as low as minus 10°C, in only ten minutes. Toshiba will continue to develop higher energy density batteries that extend the range of EVs and support ultra-rapid recharging, and aims to commercialize the next-generation SCiBTM in fiscal year 2019."